USD’s Sigma Alpha Epsilon chapter is preparing for the construction of a new facility, and is hoping to break ground by summer 2016. With $1.5 million raised out of the $3 to $4 million needed, SAE finally went to the public for funds during this year’s Dakota Days. “It’s just time for a new facility. This one is becoming extremely difficult if not impossible to keep up with everything,” SAE Chapter President William Lewis said. The house, built in 1962, features a dated structure and has been grandfathered into many city codes it would otherwise be violating. “The house was built for people in the 60s, not for our modern day conveniences,” Lewis said. The new SAE facility will include 36 to 40 rooms, and each SAE member pledges $100 per semester to go toward the new house. 100 members, Lewis said he hopes to bring the chapter up to around 120 members in the coming years. Though he doesn’t think that this addition will necessarily impact the number of recruits, Lewis doesn’t believe it will hurt the fraternity to have the newest Greek house on campus. The house will be built on land donated by SAE alum Harvey Jewett. Jewett donated the land to the SAE House Corporation around 1998, Lewis said. The land stretching from Howler’s Bar & Grille to Alumni Road is owned by the fraternity’s House Corporation, which acts as a sort of monitoring board for all SAE property, Fraternity and Sorority Life Adviser Laura Roof said. Roof said though it’s common for sororities and fraternities to remodel their houses, a complete rebuild is very uncommon. 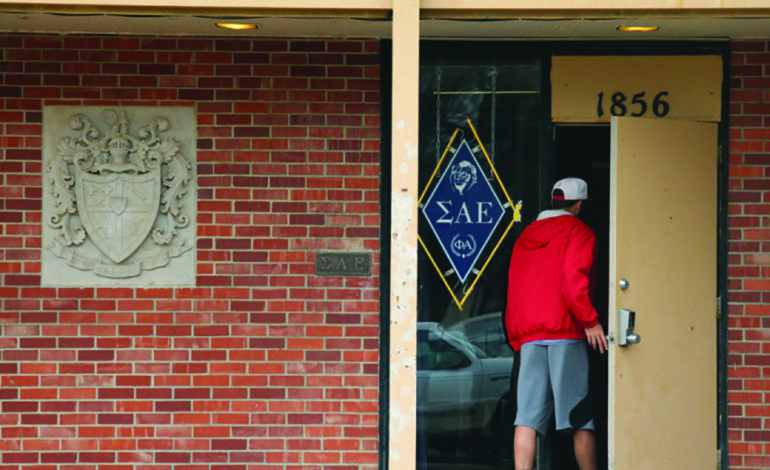 SAE’s members are looking forward to the new change in facilities. “The new house will give us an even better environment to congregate with our fellow brothers and help us focus on bettering the fraternity as a whole,” SAE pledge Kane Guisinger said. Lewis believes this change will allow SAE members to be part of a big event in their chapter’s history. “(This is the) third most significant period behind our founding in 1911 and our building of our current chapter facility,” he said.